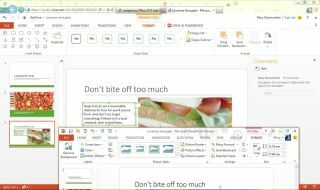 Microsoft is planning new features for Word, Excel and PowerPoint as priorities in its creation of real-time co-authoring in Office Web Apps. An Office 365 blogpost provides a pre-release introduction to the new features, said to be in the works at the moment, which are aimed at bringing more Office capabilities to the apps. The thrust of the changes will be to enable all of those working on a document to see who else is involved and any changes as they are made rather than when it is saved. Word will include a new Find and Replace function, along with the ability for anybody working on the document to add headers, footers, footnotes and comments. The Excel app will provide for real-time co-authoring within cells and make it possible to see immediate updates on data and any accompanying graphics, along with Freeze Panes and Autofill functions. Meanwhile, PowerPoint users will get SmartArt and the ability to see thumbnails on a slide. Amanda Lefebvre, the technical product marketing manager for Office Web Apps, says in the blog that the goal it to make the user experience on Office Web Apps the same as on Office.